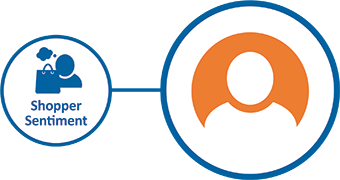 The Retail Economics Shopper Sentiment Survey measures confidence in key areas underlying consumer spending such as personal finances, savings, job security and perceptions on the strength of the UK economy. The Survey adds behavioural context to hard economic data and helps inform our insight into consumer trends in the retail industry. Our latest Shopper Sentiment Survey suggested that expectations about the economy were little changed compared with the previous period. Anxiety over Brexit accelerated to its highest level since the referendum, while ‘lack of savings’ and ‘repayment of debts’ were also top concerns. Overall, the backdrop for consumer spending remains weak with almost 50% of consumers suggesting they are planning to spend less or cut back their spending in the next quarter. There was a slight deterioration in our latest Shopper Sentiment Survey with expectations about the economy and personal finances weakening over the next three months. Anxiety over Brexit remained at its highest level since the referendum while concerns about ‘a weaker economy’ and ‘rising interest rates’ grew. Overall, we expect the backdrop for consumer spending to soften, as weakness in the propensity to spend outweighs any improvements in spending power. Indeed, a fifth of consumers expect to cut back their spending over the next quarter. Expectations about the economy weakened over the next three months while heightened anxiety over Brexit has reached its highest level since the referendum. However, consumers’ propensity to spend remains soft; they appeared to have spent cautiously over the last three months with little sign of an improvement on the horizon. A general improvement in perceptions about the economy and personal finances is likely to reflect the sharp fall in inflation and real wages resurfacing for the first time in a year. However propensity to spend remains weak with consumers appearing to have spent cautiously over the last three months which has rolled-over to their spending intentions over the next three months. There has been a slight improvement in our shopper sentiment results this quarter with consumers expectations about their personal finances improving. That said there has been a sharp shift in the sentiment of younger consumers particularly the 18-24 age group who have grown more pessimistic about the economy and their personal finances since the previous quarter. As personal finances come under increasing pressure consumers expectations about their personal finances have fallen further. Respondents also suggested that they have started to trade down to cheaper alternatives as well as shopping less frequently in order to better manage their finances. 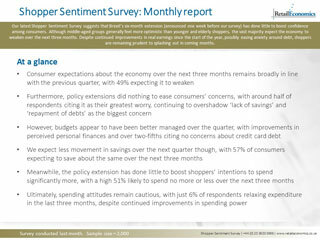 Shopper sentiment weakened markedly in the last quarter according to our latest Shopper Sentiment Survey. Current and future personal finances levels of debt and spending intentions for consumers were down on last quarters levels. Against a backdrop of more challenging economic conditions the latter half of 2017 is likely to present an intriguing mix of tougher conditions. Shopper sentiment on the performance of the economy weakened slightly in April compared with January as worries about Brexit and repayment of debts continued to dampened consumers spirits. Furthermore 38 per cent of consumers suggested that they intend to cut back on discretionary spending in the next three months. Shopper sentiment has seen a general improvement on the previous quarter although the backdrop for households remains challenging. Our research suggests that consumers would cut back on eating out takeaways pubs and restaurants first if they felt like their personal finances were under pressure. Overall confidence about the economy personal finances and savings has deteriorated over the last quarter. The biggest drop in confidence was seen across older consumers who are likely to be more concerned with rising costs of living.